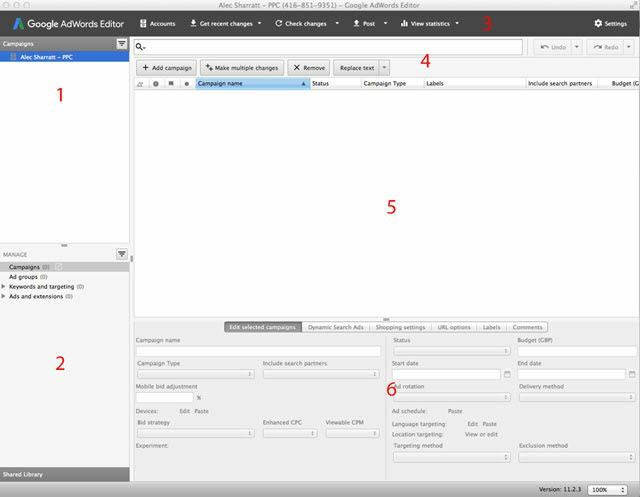 We have illustrated the core components of AdWords editor in this section, we discuss each component and what it means, how to use it, etc in other guides within this section of the Knowledge Base. This should help to build a familiarity with the layout each pane / panel within the layout and ultimately what each function does within this layout. Below is a top level and brief description of each pane / panel within the application, we cover this in more depth immediately after these summaries. 1. Campaign Tree = This section lists all of the campaigns and ad groups within the account. Each Campaign can be expanded to show all of the ad groups contained therein. 2. Type List = Selecting options from this section will display the selected component in ‘5’. For example, if you select a campaign in ‘section 1’ and then you select ‘keywords and targeting’ from ‘section 2’… You will see all of the keywords contained, in the selected campaign, in section 5. 3. Menu = These are options for interfacing with the live account, you can download the account, post changes, check offline vs. online, etc from here. 4. Search & Options = These options change depending on what has been selected in ‘section 2’. Typically, they allow you to add or remove components (keywords, ad groups, ads, etc). 5. 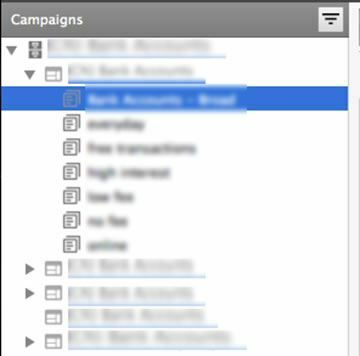 Data View = This is where account components are shown and managed from; this is where campaigns, ad groups, keyword, ads, placements, etc are all listed. This can be used for navigation and selection of components, but you can also make changes directly into this pane. 6. Settings Panel = This is where account components are edited once selected in ‘section 5’. What you see here depends on what you have selected in pane ‘5’ of the application, thus you could edit any component of a campaign, ad group, keyword, etc here. All of the above are described below in more detail below (and these numbers are referred to throughout this guide). From here you can select the whole account, campaigns or ad groups and whatever has been selected will determine what is shown in the ‘data view’ (pane 5). We cover these kinds of features later on in the section on ‘navigation and general usage’. The ‘type list’ (see example screenshot below) shows all of the types of components that exist within the AdWords account and that can be accessed and / or edited within AdWords Editor. The list above is largely an unsorted list of ‘Keywords & Targeting’ components; we cover each of these in more detail in other articles that address these in a more structured way. For example all display network components are discussed in a guide on the display network. All ad-related components listed above are covered in a guide on ads. This is covered in more depth in the section on AdWords Editor Specific Features below; where we cover posting, checking and getting changes from the account. We break this section into its two core components below. The search (or filter) field (shown in the below screenshot) from here you can type in words, hit enter and results will be listed in the data view (pane 5). This is a very powerful tool for filtering through account data allowing you access to just what you want to access. It is also possible to create more complex filters combining multiple criteria, for example; campaigns containing specific text in their name, status is active and CPC is over $1. There is a vast amount of potential search fields. However, the data shown in the data view (pane 5) will be affected by both what campaigns or ad groups are selected in the campaign tree (pane 1) and what Type List component is selected. So searching for X, Y or Z will only show results in the data view if the campaign tree and type list have relevant components selected. Using the drop-down menu for search will ensure that the syntax of the text within the search field is accurate, but this is very simple and intuitive and thus easy to pick up and learn. The best way to familiarise yourself with this is to perform searches, adding more and more parameters to the search and check out the results. The options that are shown as buttons beneath the search field will change depending on what is selected within the Type List. For example, if you have ‘campaigns’ selected, the options will be different to those available when ‘ad groups’ are selected. These options are consistent across nearly all Types Lists items, typically changing only the text within the button. We cover the most common of these below; you should start to see the manner in which these options are structured after just a few examples. The ‘Data View’ panel is where data is viewed that has been previously selected from the Campaign Tree and Type List. From within the panel you can select items (be they campaigns, ad groups, keywords, placements, etc) and copy them, cut them, pause, activate, remove, etc. Double clicking on an item will load that item, in much the same way that double clicking on a folder within your explorer window. It is also possible to edit fields within the Data View panel directly by clicking on the field that you want to edit. It is possible to add or remove columns as well as changing he order that they appear in. = Verified Status: This shows the status of items within the Data View and is colour-coded. Yellow Circle: The may be an issue with this item, typically a policy violation. = Comment Icon: This highlights whether a comment exists for an item, you can view this within the ‘comments’ tab within the Settings Panel (Pane 6). This is the part of the tool where all of the options for editing are located; depending on what is selected (keywords, campaigns, ad group, etc) will determine what is shown to you in this section. We look at the most common selections and options found in this part of the application. Like many other components of AdWords, this section has different options for every Type List item you can select, we do not cover all of these possibilities here because we cover them in more detail in other guides. Follow the link for more information on campaigns and what all these settings mean. Follow the link for more information on ad groups and what all these settings mean. Follow the link for more information on keywords and what all these settings mean.